Border Collies and related dogs like my Mc Nab Dog are said to be the dog that returns to the shelters in the highest proportions of all breeds. You find yourself looking for ways to keep them occupied just like a child because if you don't they have been known to "tear the place up". I've been very lucky with my Lettie. She has lived with me since I got her in 2002 roughly at Thanksgiving and I've always lived within walking distance of shopping districts. My choice, I prefer the mental stimulation of new people as well as she does. So what do you do? In my case, long walks work. Three times a day, three miles total with her. Just ask the Police here in Wilton Manors - they're friendly folks and most of them wave hello as I'm well known for walking around the place. When you get home how do you keep her happy? Plenty of soft toys are a start but dogs do like a challenge and a good chew. Also a treat here and there. Peanut butter. High protein and good for you. Part of my breakfast today was a little Peanut Butter on some saltines. We get the stuff in five pound jars, larger than the little jars you get in the supermarket, from GFS. If you have a GFS in the area, who ever they're sourcing their Chunky Peanut Butter from is giving us an excellent treat because I swear by the stuff! But what to do with the jars when you're through? The Parrot watches me eat the stuff and begs. Lettie shows up and glues herself to my right calf wanting some too. It's a large jar, and sturdy too... but it's too big to carry so I'll stuff a few dog biscuits inside, shake them around to get some of the "leftover" peanut butter out and give her one a day. 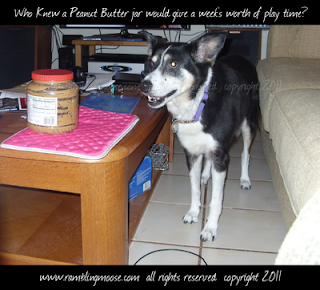 So now we're at a week and a half since there were about 10 dog biscuits in that jar soaking up Peanut Butter. It sat on my room divider in clear view of the parrot who gave up trying to open it because the jar was SO big. Lettie's too polite to climb on the furniture to grab the Jar so it sat there. Taunting her to give up the peanutty goodness inside for a solid week and a half, it was watched and guarded by her. It's also clearly within reach, sitting on the laptop mat. I finally decided on day 12 that it was time and gave it to her. This jar as you can see can't really be carried by a 47 pound dog who is too polite to shred it just yet. I set the jar on the ground on it's side. Put my size 11 shoe on the jar from the side and gave it a push to make it squirt out from the bottom of my foot. 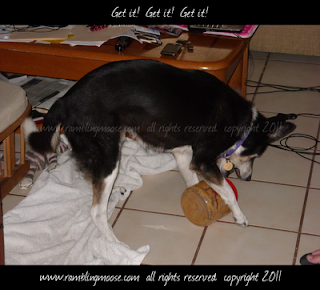 At that point, Mrs Dog went into a Border Collie Frenzy! The jar was rolling along but not moving very far until friction slowed it enough to get a purchase on the floor and allowed it to roll out of sight. Meanwhile the low friction of the floor plus the low friction of the plastic jar meant that little Mrs No Thumbs Dog couldn't grasp the silly thing. She'd be chasing it all over the place. Bat at it with one paw and it would shoot under her legs and under the table. Another paw would knock it over to me and of course I'd squirt the thing across the room with my shoe. We had kept up with this for days. Literally a week. She never did get the jar open. The lid was way too big for her to get in her mouth, and eventually she'd begun to cool towards it. Eventually she'd figured out that she could just carry the thing around the house but didn't realize that if she had chewed the lid off she'd have the prize inside. Needless to say if the peanut butter jar was in play, I was actively watching and participating in the fun. Finally she did get into the Jar. What happened was she got so frustrated at the whole process of "Keep Away" that she started to yip at the silly thing. This got me more excited by the process and instead of popping the jar from under my foot, I managed to step on the lid. The lid split cleanly in two and she went to town. The prize of the Peanut Butter was hers! After around three weeks, she FINALLY had her joy of peanut butter. The jar was too small to fit over her head so she only managed to get about 1/2 of the brown gooey treasure out and into her. She's not used to people food, I keep her on a strict diet, more strict than I keep myself on in fact. So one thing to concern yourself with, Peanut Butter Is A Rich Food for a Dog. Just watch out because the next morning, long after the jar was in the trash can, I woke having to clean up after a bit of "dog sick". Crispy Smoked South Florida Anyone?